Sacramento, CA – August 14, 2018 – Californians Together is releasing a new report today entitled Masking the Focus on English Learners which questions the efficacy of the state accountability system in identifying the needs of English Learners accurately. The report states that by combining data from two English Learner subgroups (current and reclassified), the system masks the distinct needs of each subgroup and diminishes the urgency to address the numerous educational needs of current English Learners thus undermining the central equity intent of the Local Control Funding Formula. The report’s strongest recommendation is that the state discontinue aggregating the two subgroups and instead report them separately for analysis and planning. “There is great potential for California school districts to be misled by the results of the combined EL subgroup on the Dashboard. The decision to combine this data from two student groups with distinct language and academic profiles masks and impedes districts from addressing their distinct academic needs” said researcher and co-author, Dr. Magaly Lavadenz. The report also states that the system largely misses the mark in identifying research-based programs, actions, and services for English Learners. Despite all 24 districts being rated at the two lowest levels for English Learner performance, only 6 mentioned a concern for achievement in English Language Arts and only 1 specified a concern for their overall achievement. Minimal specific professional development was offered to teachers of English Learners. “Obscuring current English Learner results has detrimental effects on districts’ abilities to address goals in local plans, set growth targets, focus program, and services and allocate funds for this group of students. We call on the State Board of Education to rectify this accountability policy in order to ensure every English Learner can best be served,” said Shelly Spiegel-Coleman, Executive Director of Californians Together. The study was conducted in collaboration with the Center for Equity for English Learners at Loyola Marymount University and reviewed local plans for 24 school districts that serve 23% of California’s English Learners. Our latest report Masking the Focus on English Learners questions the efficacy of the state accountability system in identifying the needs of English Learners accurately. The report states that by combining data from two English Learner subgroups (current and reclassified), the system masks the distinct needs of each subgroup and diminishes the urgency to address the numerous educational needs of current English Learners thus undermining the central equity intent of the Local Control Funding Formula. The report’s strongest recommendation is that the state discontinue aggregating the two subgroups and instead report them separately for analysis and planning. Los Angeles, Calif. (August 31,2016): Students who have been enrolled in California schools for six years or more as English Learners, are not making adequate progress in learning English and are struggling academically constitute 62% of all the English learners in grades 6-12 according to data released today by the California Department of Education(http://data1.cde.ca.gov/dataquest/SearchName.asp?rbTimeFrame=oneyear&rYear=2015-16&Topic=LC&Level=State&submit1=Submit). As the new school year is beginning, every school and district has been given the data to identify these students, called Long Term English Learners (LTELs), and hopefully will have plans to accelerate their language and academic growth. The new data furthermore shows that 29% of all English learners who have been in California schools for four or five years are at risk of becoming LTELs with the majority of these students in the lower grades. For the short term, Californians Together calls upon the state, the county offices of education, the districts and schools to use this data to respond to the legal mandate of the LCFF to provide “increased or improved services and programs” for English learners. The plans that districts write documenting how they will spend their budgets needs to be explicit about how they will yearly reduce the numbers of LTELs and students at risk and what specialized instruction and programs they will implement. “The real goal for California’s schools and district should be to guarantee that no English Learner becomes a Long Term English Learner. There are research-based models and documented successful practices to provide districts with the direction they need to serve and prevent students from becoming LTELs. Each school and district should commit to assessing their current EL programs and investing in what we know works,” said Xilonin Cruz Gonzalez, president of Californians Together. 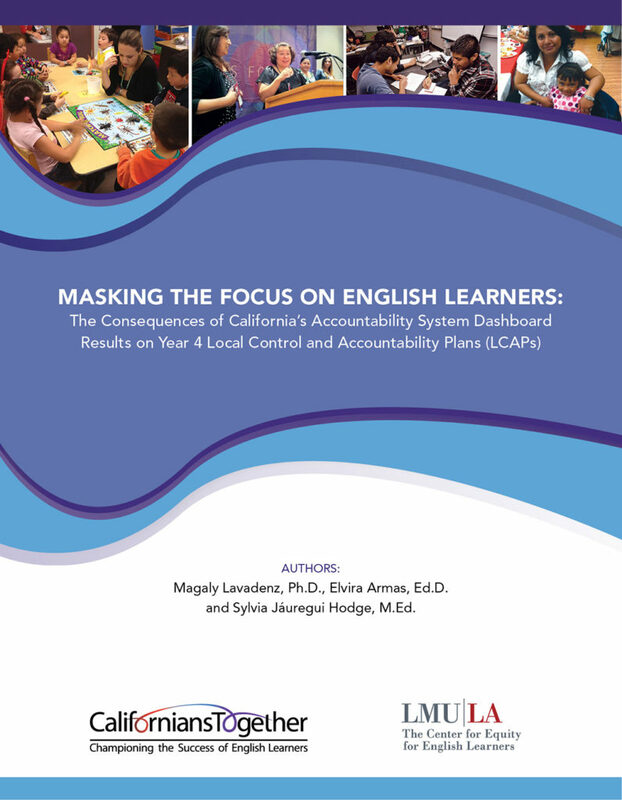 A new report that reviewed the Local Control Accountability Plans of 29 key school districts throughout the state, and the impact those LCAPs are having on English Learner students, was released today by Californians Together. The report, titled “Falling Short on the Promise to English Learners, A New Report on Year One District Local Control Accountability Plans,” found that LCAPs tend to be characterized by woefully inadequate specificity and weak attention to how schools are meeting the various needs of English Learners. Does Your Local Control Accountability Plan Deliver on the Promise of Improved or Increased Services for English Learners? The intent of California’s Local Control Funding Formula (LCFF) is to give districts more flexibility with their state funding but at the same time to create a new school finance system that recognizes that students with specific demographic factors need greater support to address their academic needs and improve educational outcomes: English Learners, low income students and foster youth. As Governor Brown stated in January 2013, “Equal treatment for children in unequal situations is not justice”. LCFF recognized that English Learners have additional academic needs requiring additional resources to “improve or increase services”. LCFF was designed as a step towards a more equitable school finance system. To provide guidance for LEAs in designing, funding and implementing programs for English Learners using LCFF appropriations, Californians Together, The California Association for Bilingual Education (CABE), Californian Rural Legal Assistance (CRLA), and the Center for Equity for English Learners (CEEL) developed a set of rubrics that address 10 focus areas with high impact on English Learners. [Read more…] about Does Your Local Control Accountability Plan Deliver on the Promise of Improved or Increased Services for English Learners?